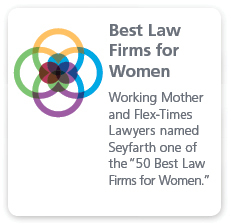 Seyfarth Shaw LLP’s Franchise & Distribution attorneys draw upon decades of experience to assist our clients as they plan, structure, develop and grow their franchising systems and as they confront the numerous issues affecting their franchise, dealer, licensing and distribution networks. We help clients structure and manage those networks to minimize risk while achieving their business and strategic objectives. Our experienced team of lawyers can help your company develop its franchising programs through the initial stages, and then lead the process of drafting comprehensive disclosure documents which meet all of the federal and state legal requirements from a regulatory prospective. When disputes arise, our experienced team of attorneys located throughout the country work to aggressively, strategically and efficiently enforce our clients’ rights. Our Franchise & Distribution practice leaders are well recognized as pioneers and thought leaders in the fields of franchise law and strategy, and serve as authors of multiple books, hundreds of articles, and regularly conduct media appearances, speaking engagements and on-site training to our global base of clients. Our practice leaders regularly appear as program panelists for a variety of organizations, including the International Franchise Association, the International Franchise Expo and overseas franchise associations. Our team of nationally recognized Franchise & Distribution attorneys represents manufacturers, distributors and franchisors in all aspects of their relationships with dealers, franchisees, licensees, and other participants in their supply chain and distribution networks. We understand the federal and state franchise registration and disclosure requirements and can assist clients in navigating those obligations. Our experience and capabilities include gathering relevant client information, and helping prepare disclosure documents, franchise agreements, operating manuals, policies and standards, and related agreements. Our experience and knowledge covers the broad scope of legal issues and challenges that our clients regularly face as they develop, structure, operate and manage their franchise and distribution networks. We have worked with clients in numerous industries, including motor vehicles, heavy equipment, hospitality, fast food, convenience stores, specialty retail, real estate services, apparel, temporary office leasing, petroleum, financial services, and home furnishings. While the services and products are varied, a core set of critical legal issues are common to all. We know the importance of understanding our clients’ businesses so that we can help them effectively navigate the complex patchwork of state and federal laws affecting their industries as they establish, manage, and restructure their distribution and franchise networks. Our team takes a unique approach to the development of the regulatory documents that will be the backbone of the franchise offerings. We understand that these documents are not only used for regulatory purposes but will be the documents which franchisees will use to measure the strength and future viability of a franchise system. We approach the development of these core documents from the perspective of a marketing document that will meet all the regulatory requirements, while telling a compelling story about the history and future goals of the company, its core values, its business model and its company objectives. We have also worked on hundreds of domestic and international master franchising, joint venture, multiunit development, subfranchising and area development agreements in over 50 countries over the past 30 years. When disputes arise, we bring an unmatched track record litigating and arbitrating literally hundreds of cases before state and federal courts and administrative agencies throughout the United States. Our attorneys have defended individual, multi-plaintiff and class actions, and have obtained numerous favorable dismissals, summary judgments, trial verdicts and appellate decisions. We have been retained as national and regional franchise counsel for a number of Fortune 100 clients. We also understand that many times the client’s strategic goal is to try to resolve the dispute consensually. In those situations, we bring a deep breadth of experience in negotiating favorable solutions with franchisees, dealers, suppliers, distributors and government agencies directly or through alternative dispute resolution. Our Distribution & Franchise attorneys help our clients develop, establish and restructure their distribution, franchise, and license arrangements. We have helped clients with all aspects of their network agreements, including preparing, modifying and updating various forms of relationship agreements. We are well equipped to prepare and help you deploy the necessary documents quickly and efficiently in the marketplace to ensure that your company is in compliance with both federal and state laws and regulations. Among other things, we regularly negotiate our clients’ dealer and distributor agreements, framework agreements, area development or multiple ownership agreements as well as various other related agreements, including holding company arrangements and various forms of license and agency agreements. We strive to always stay ahead of the legal and strategic curve as it comes to the rules and regulations that affect franchisors in both franchising laws and legal developments which impact the business model. This means being prepared to efficiently update and make necessary adjustments to disclosure documents and agreements on a regular basis. Our clients include globally recognized specialty retailers, quick-serve fast casual and full-service restaurant chains, automobile distributors, automotive repair and maintenance, business services, home services and related business format franchisors. We also develop strategies for how to best structure various networks for distributing products and services and implement new or modified agreements. We can also play an active counseling and oversight role in that process if clients chose to use other providers and consultants to develop these basic documents, which we then help customize to meet our clients’ specific needs. We often draw on the expertise of Seyfarth’s leading M&A practice, which has been engaged in more than 250 transactions over the last two years, including representing the buyers and sellers of franchises. Our M&A attorneys help clients evaluate, negotiate, structure and execute transactions, including conducting due diligence and working across other disciplines to address tax, antitrust, employee benefits, and intellectual property issues. In addition, our team is experienced in the nuanced issues of buying and selling franchises – from addressing compliance and regulatory issues, reviewing franchise-related provisions, and assessing the impact of distribution, franchise and license arrangements already in place. The Distribution & Franchise team uses SeyfarthLean, our proprietary, value-driven client service model, which combines the core principles of Lean Six Sigma process improvement with project management and tailored technology solutions. The group makes use of right-sized staffing and alternative fee arrangements, along with process mapping, best practice documents, standardized forms, and protocols for e-discovery to manage costs and facilitate an efficient and effective client engagement. 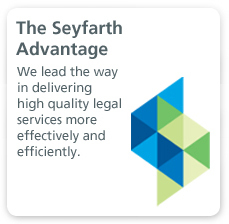 Technology plays a significant role in our approach, and as one example, we have utilized SeyfarthLink, the firm’s award-winning client collaboration platform, as the basis to develop integrated multi-state franchise litigation portals and a variety of streamlined national and international trademark and real estate portfolio tracking and management, all to enable our clients to achieve predictable fees, reduced cost, greater efficiency, and improved outcomes in franchise matters. 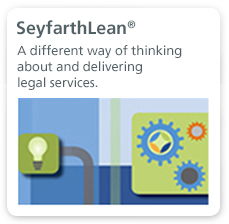 SeyfarthLean creates tangible results for clients, including more consistent and high quality legal services, increased efficiency, improved communication and collaboration, committed and transparent pricing, and reduction in overall cost of services. 2/7/2019 High Risk, High Reward: When is it Time to Establish or Grow a Cannabis Franchise System?